Edraw Gantt chart templates offer you plenty of special Gantt shapes. You will find these shapes of great help when drawing the Gantt diagrams. 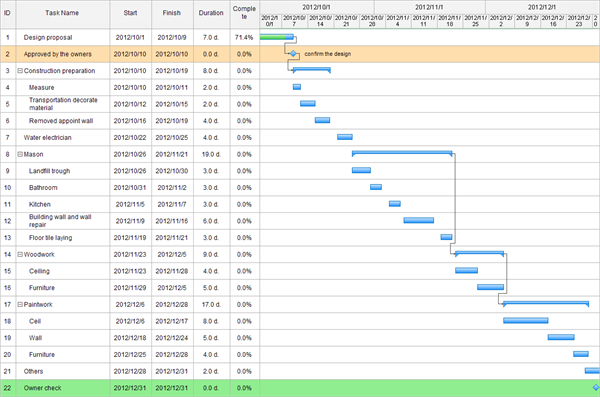 Gantt charts are useful to show additional information about the various tasks or phases of the project. A Gantt chart allows you to see at a glance about what the various activities are, when each activity begins and ends, how long each activity is scheduled to last. Summary tasks can contain other summary tasks as subtasks. Task dependencies displays the dependencies between tasks. Task is used to show planned start and end dates. Task progress displays the completeness of the task. Milestone defines the general task properties. 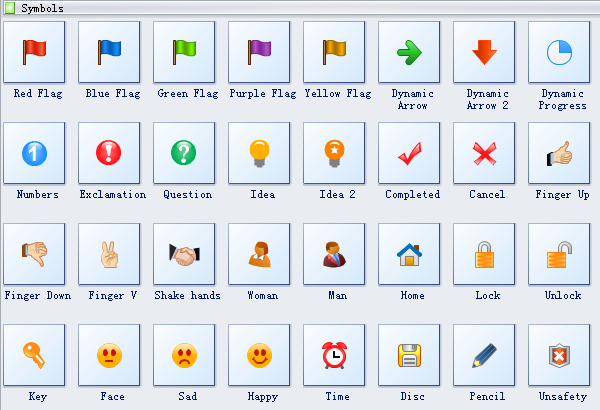 The following picture is the commonly-used symbols we provide in our software including flags of five colors, dynamic arrow, dynamic progress, numbers, question, idea, completed, cancel, happy or sad face, etc. Thumbs up is a gesture in which you hold your hand out with your thumb pointed up in order to say yes, to show approval, etc. Thumbs down is a gesture in which you hold your hand out with your thumb pointed down in order to say no, to show disapproval, etc. V sign is a hand gesture in which the first and second fingers are raised and parted, whilst the remaining fingers are clenched. It is commonly used to represent the letter "V" as in "victory". Need fresh looking Gantt chart symbols for your design? These Gantt chart symbols are a cinch to pop in. And their crisp, fine detail will make spectacular, easy-to-understand diagrams and presentations to your customers. How to Track Project Progress Using Gantt Chart? What Is a Dependency in Gantt Chart?